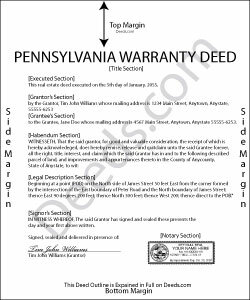 A warranty deed is a type of real estate deed that can be used to transfer title to real property in Pennsylvania. The statutory form for a conveyance of real property appears in 21 P.S. 1. A warranty deed is construed to include all the estate, right, title, interest, property, claim, and demand of the grantor, in law and in equity (21 P.S. 3). The words "grant and convey," or either one of said words when used in any conveyance of real estate will be judged an express covenant that the grantor was seized of an indefeasible estate in fee simple in the property conveyed, free from encumbrances done or suffered by the grantor, and also for quiet enjoyment against the grantor, his heirs, and assigns, unless limited by express words in the deed (21 P.S. 4). A covenant from the grantor that he will "warrant generally the property hereby conveyed" is construed to mean that the grantor covenants to the grantee that he will forever warrant and defend the said property, and every part thereof, unto the grantee, his heirs, personal representatives, and assigns against the lawful claims and demands of all persons (21 P.S. 5). Before a warranty deed can be recorded in Pennsylvania, the deed must be signed and acknowledged by the grantor or grantors (21 P.S. 42). The acknowledgment of a deed can be made in Pennsylvania before a judge of a court of record, a clerk or deputy clerk of a court having seal, a recorder of deeds, a notary public, or a justice of the peace (21 P.S. 291.2). A warranty deed that has been acknowledged, either in Pennsylvania or in another state, must have a certificate of acknowledgement by an officer under seal (21 P.S. 46). A warranty deed that has been executed and acknowledged in a state other than Pennsylvania will be valid as if had been made, acknowledged or proved, in the proper county where the land is situated. A deed executed and acknowledged out of state must be proved and acknowledged in the manner consistent with 21 P.S. 41. A duly acknowledged or proved warranty deed should be recorded in the county where the property is located. Every deed that is not acknowledged or proved and recorded will be fraudulent and void as to any subsequent bona fide purchaser, mortgagee, or holder of any judgment, duly entered in the recorder of deed's office in the county where the land is located, without actual or constructive notice, unless such deed is recorded before the recording of the deed or conveyance or entry of judgment under which such subsequent purchaser shall claim (21 P.S. 351). The legal effect of recording a warranty deed is to provide constructive notice to subsequent purchasers, mortgagees, and/or judgment creditors of the parties to the said agreement (21 P.S. 357). Barbara E. said: Fast efficient, just what I needed. Reply from Staff: Thank you so much Barbara. We appreciate your feedback.